The idea for the electric kazoo occurred to me in 1996 during an impromptu jam session. As a friend jammed on my guitar, I began to accompany him on a kazoo that was sitting around. Looking at my guitar pedals strewn across my floor, I said "it would be cool if I could run the kazoo through the guitar pedals like an electric guitar". The idea got filed in the back of my mind and I experimented from time to time but nothing really sounded great. In 2002 I found myself unemployed and approaching homelessness. Suddenly, my desire to create an electric kazoo had a new urgency. A few prototypes later, the Kazooka was born. From the moment I tried my first prototypes of the model that would later become the Kazooka Standard through a guitar amp, I knew that I had something that sounded good; something that other musicians would enjoy. Now that I had a product, I wanted to give it a name. The idea for the name Kazooka came while looking at a display of Bazooka bubble gum. The Kazooka Standard underwent 2 cosmetic revisions. One in late 2003 and one early 2004. The Kazooka Standard remained in production until the end of 2009. Roughly 4000 Kazooka standards were built. 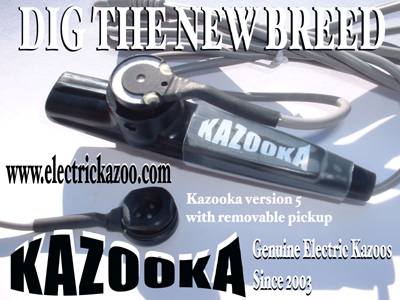 In late 2004 the Kazooka Version 5 Electric Kazoo was released. Only about 1000 Kazooka Version 5's were built. 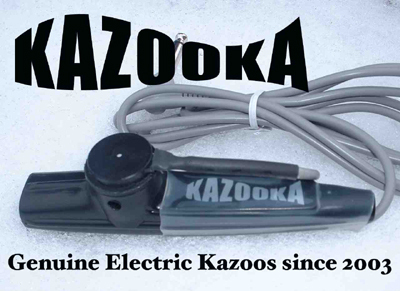 Kazooka electric kazoos have been heard in major motion pictures, television, popular recordings, live performances, street corners, garages and many of your bedrooms to the chagrin of a few wives and cats. I hope that the electric kazoo will live on and inspire future generations of musicians long after I am gone.